A Day in the Life of a 12! 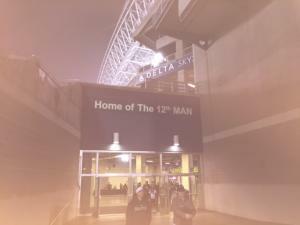 I attended my third Seahawks game this past weekend when we played against the Carolina Panthers, and let me tell you, out of all of my experiences at each game, this one was the best! The first game I went to was last season when we played against the Jacksonville Jaguars and we had tickets in the Hawks Nest. The Hawk’s Nest has GREAT views of the field and very excited fans, but bleacher seating with no cover, can be slightly uncomfortable when it’s raining in Seattle. My second game was in San Diego against the Charges, and it got up to 115 degrees that day, and I was on the edge of fainting because it was SO HOT! I much prefer Seattle&apos;s more mild climate. The Panthers vs. Hawks game was tons of fun, comfortable, and exciting. The weather was perfect and the players and fans were on point. 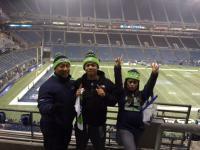 Getting into the city, my family and I left a few hours early to drive to the Light Rail Station in Tukwila. There were so many Hawks fans on the train it created such a great energy and excitement for the game. After exiting the train we walked around outside the stadium for a bit and passed a bunch of tailgates in the parking lots and on the side of the road. The amount of energy and excitement from each and every fan that I walked by built me up to be more and more excited for kickoff and game time!!! Before entering the stadium itself, we entered the event center right next door to CenturyLink Field for our pre-game activities. At the event center, I got free stuff like a clear bag that is permitted into the stadium, a Seahawks headband, a Seahawks towel, and some other miscellaneous Seahawks stuff. It is important to remember big bags are not allowed in the stadium so if you have a lot of things to bring in, these clear bags are a must! Entering the stadium, I got my ticket out and headed in to the madness. Food booths everywhere, and you know when you’re at a game in Seattle you have to get a hot-dog and some garlic fries, so that’s the first thing I did. Of course, once you’re done eating, you grab your beer(s) and head up to your seat. Once I got up to my seat, I (of course) went a little picture crazy. At CenturyLink, the further up seats are in the 300 section, and that’s where we sat, but it’s PERFECT! The view is great because you can see everything, and on top of that you’re covered so it’s a bit warmer and less wet (if it was raining!). Kickoff started and I was just in awe of how dedicated and fun our Hawks fans are! When all the players were coming out on the field, it was so loud, I think we may have started an earthquake (again). 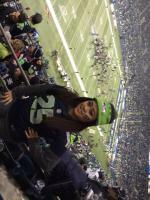 When the game went on, and our Seahawks were leading the game majority of the time, I was so proud to be a fan and just be there in my home-city cheering on one of the best football teams in the league! After the game, the stadium usually clears out, but of course it’s still open for everyone to take pictures and explore. My family and I took pictures overlooking the stadium, and the staff sat there and talked to us about the game afterwards and they were so friendly and nice. Upon exiting, we took in the fun views from above all the fans at the bottom cheering and celebrating the big win. Around the stadium are facts and fun pictures about Seahawks&apos; highlights and tokens from their most remembered games. 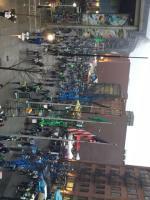 I am so proud to live in Seattle and be a fan! 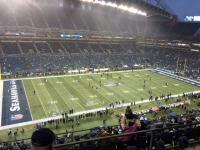 Next season, I will definitely try to get up and go to more games, and I will ALWAYS recommend to any local who has not been to a game to go, or any travelers who have not been to a football game at all, to get to one, because the best experience for a first football game would definitely be at a Seahawks game. #GOHAWKS!